In my latest reports covering the detached market and the condo market across Greater Vancouver I highlighted a few things. Detached sales are down 52%, townhouses 40%, and condos 22%. Prices are on the way down, especially in the detached market which is showing most areas are down about 15%. Because I primarily work the Vancouver condo market, and most of my clients have requested a bunch of data I’ve decided to put together this Vancouver condo report. I’ll be focusing on a few areas, Downtown Vancouver, Yaletown, West End, Kitsilano and False Creek. I’ll also highlight Vancouver West as a whole. Unfortunately I just don’t have enough time or resources to pull and analyze all the areas such as what’s happening on the East side. So without further ado, I bring to you the Vancouver condo report, which I will breakdown and analyze on a monthly basis. Sales are falling across the board for Vancouver condos. Vancouver West condo sales are down 35% year over year and are 13% below the 10 year average for the month of November. Average days on market is creeping up. Although condos are still selling quickly the trend appears to be upwards since hitting a low of 17 days in August. 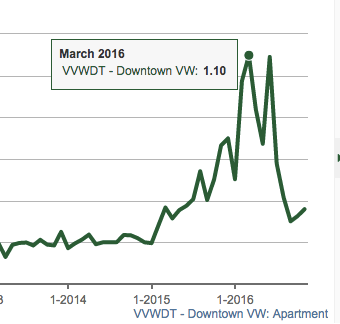 The average days on market for Vancouver West condos was 33 days in November, 2015. Inventory remains tight, indicating it’s still a sellers market. However, with sales falling rapidly, any influx of inventory could put it into a balanced market. The sales/actives ratio indicates how active the market is. As per the Real Estate Board anything above 20% is considered a sellers market, anything below 14% is a buyers market. Although the sales/actives ratio still indicates a sellers market it appears to be inching towards a balanced market. For example, Downtown Vancouver hit a sales/actives ratio of 110% in March and a 109% sales/actives ratio in June (totally unprecedented), it’s now down to 36%. Vancouver West condo prices are down 2% from it’s peak in July as per the MLS benchmark. In most areas I’m seeing a 5% correction when looking at current sale prices comparing to sale prices back in the peak. Some areas, such as False Creek, is showing a 9% drop in the MLS benchmark price. Vancouver condos are definitely in the process of correcting. Sales have dropped significantly over the last few months and are now below the 10 year average. With that being said, inventory levels remain at record lows which are keeping prices from falling much. We will see an increase of inventory in the New Year as sellers decide to list their homes after the holidays. This sudden increase of inventory could tip the scales and push the condo market into more of a balanced market.